Why should I choose Publish Your Purpose Press? Publish Your Purpose Press was created with you in mind, the purpose driven person. 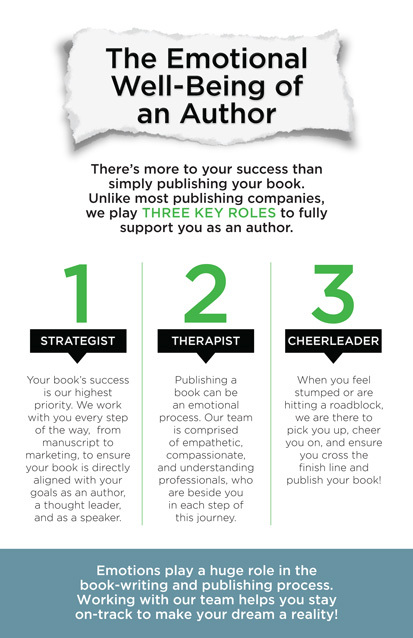 We understand that a publisher – author relationship must be mutually beneficial. Our mission at PYP is to discover and publish authors who are striving to make a difference in the world, who have a story to tell, an author brand to build – that can and will make an impact. We work with authors of all kinds that fulfill the mission of being a purpose driven individual. Regardless of what your purpose is, we want to help you amplify your message, to help others, and to grow your author brand. We won’t strong arm you into working with us if it is not the right fit – for both of us. We look out for your best interest as well as our own. At PYP we are fully invested in, and committed to, the success of our authors. We are focused on building long-term author relationships, not just business transactions. At PYP we go beyond the standard editing approach and insist all of our authors go through an extensive developmental edit process, which ensures your book provides the best reader experience that aligns with your end goals. At PYP we realize our author’s success largely depends on their personal brand reputation and having a strong author platform to disseminate their message. We go the extra mile to ensure all of our authors are focused on the bigger picture of building a movement around their books, not just the book itself. We review the author’s current brand, platform and marketing to provide a full 360-degree vantage point to ensure proper alignment. At PYP we work with our authors to create a custom marketing plan and strategy that focuses on select target audiences that will be involved in the launch of your book, which include influencers, buyers and readers. While we don’t physically hit the “post” button on Facebook for you, we do provide the framework, the blueprint and the strategy for all of your book launch marketing, which oftentimes includes social media. A lot of planning goes into a proper book launch from a marketing perspective, so the PYP team is right there with you, side-by-side in the trenches making sure it gets done. We coordinate and provide direction to your vendors, contractors, employees, volunteers, etc. Essentially, whoever is available to assist you in making this launch a success! It is by no means a go-it-alone situation. We are way too invested in our author’s success to leave anything to chance! At PYP we understand that publishing a book can be difficult. We go to great lengths to not only ensure your book is on track and meeting its deadline, but we also do our very best to manage your emotional overwhelm. Our work will allow you to maintain a clear focus on your end goals. We act as your compass to ensure you get to your end goal. We encourage you to contact us today to see if you are the right fit for Publish Your Purpose Press, and if you aren’t, we’ll give you guidance on where to go next that might be that fit you are looking for. We are the publisher for the people, looking out for the best interests of purpose driven authors everywhere. Publish Your Purpose Press fits in the middle. We provide a high quality published product at a rate that is similar to what one might pay if they did it themselves. Take a look at our Book Cost Blueprint to get an idea of the investment needed to publishing your book well. This blueprint illustrates the range of services provided and their cost. We hope it’ll help you understand the lay of the land a bit more and help you determine the best direction. If you are considering self-publishing – which we fully support, as we feel anyone can do a good quality job with the right resources – take a look at the Author’s Academy. The Academy is 14 weeks with the very specific intention of helping you from start to finish in publishing your book. The Academy runs three times per year. Please don’t hesitate in scheduling a 30-minute brainstorming call with our team. If we aren’t the right publisher for you, we will point you in the right direction to ensure you are best protected and won’t get screwed over by the next publisher you come in contact with!